Kenall won a prestigious industry award for TekLink Lighting Controls. 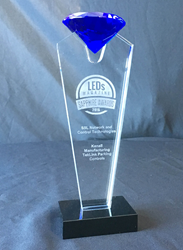 We’re honored to be part of such a well-respected group of competitors and very proud to have created something that not only increases safety and security for parking patrons but also helps facilities significantly reduce energy costs. Kenall Lighting, an independently-owned Midwestern manufacturer of solutions for challenging lighting environments, had plenty to celebrate at the second annual LEDs Magazine Sapphire Awards. The gala awards were held March 2, 2016 at the co-located trade shows Strategies in Light and The LED Show in Santa Clara, CA. Kenall was a finalist in three categories and its TekLink™ Lighting Controls won in the category of SSL Network and Control Technologies. Kenall Manufacturing was founded in Chicago, Illinois in 1963 and has built a reputation for durable lighting solutions of superior quality and exceptional value. Today, the company focuses on the high-abuse, correctional and transportation—including parking, transit and tunnel and sealed enclosure for healthcare, labs, cleanrooms and food processing. Kenall luminaires are designed and manufactured in the USA and meet the guidelines established under the Buy American Act and the North American Free Trade Agreement. For additional information, visit http://www.kenall.com.